Woodland Indians of the effigy-mound culture built thousands of mounds between A.D. 600 and A.D. 1150. The mounds of the Marching Bear Group were outlined with lime for this aerial photograph. The Mississippi River from Fire Point. Ashes found buried here indicate that this prominent spot was favored by the Woodland people for fires, possibly for ceremonial purposes. A one-mile trail leading to this scenic overlook passes several different mound types. 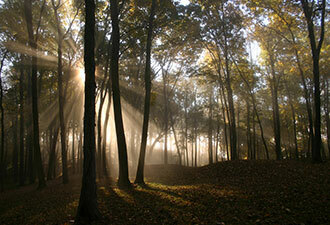 The upland forest at Effigy Mounds greets the sunrise. Nestled among the towering bluffs of the Upper Mississippi River Valley near Marquette, Iowa, are breathtaking views and 2,560 acres of magnificent scenery and mystery. Upland forest, native tallgrass prairie, and riparian and wetland habitats featuring – like charms on a bracelet – ancient American Indian mounds unfold at Effigy Mounds National Monument. The park is a sacred American Indian burial ground predating contact with Europeans. Wood-chipped trails meander among more than 200 individual earthworks, 31 of them the effigies – ceremonial mounds curiously shaped like bears and birds. 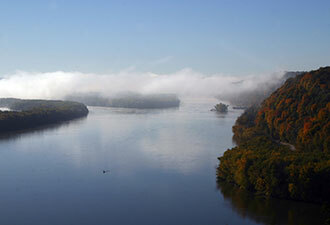 In the North Unit, hike a 400-foot incline of switchbacks up the wooded bluff. An effigy known as Little Bear – 87 feet long – and another, a "string of pearls" – 19 conical mounds – lead to panoramic views of the upper Mississippi River at Fire Point, one of five overlooks along the trail. The South Unit features one of the best-preserved mound groups in the country, the Marching Bear Group, consisting of 10 bears and three birds. Here trails are more primitive, following a former logging road that runs through a native prairie and an old U.S. Army Military Road trail dating from the 1840s. Twelve miles south of the visitor center, hike the Sny Magill Unit, another impressive grouping of mounds. This group, located along the Mississippi backwaters, consists of more than 100 conical, linear, compound (conical- and linear-combination), and effigy mounds. Hikers of all abilities can find trails at Effigy Mounds, from an easy stroll of less than a mile on level ground to a rugged seven-mile round-trip to Hanging Rock, the farthest northern point. Take ADA-accessible boardwalks to three burial mounds behind the visitor center and along the wetlands of the Yellow River, a favorite area for birdwatchers. Check out the visitor center, which includes a 15-minute orientation film, a museum, and exhibits outlining the history of the Upper Mississippi River Valley, mound-building cultures, and the national park movement in Iowa. 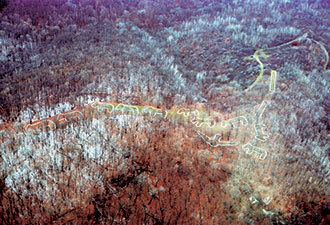 On October 25, 1949, President Harry Truman proclaimed Effigy Mounds a national monument. He used the power of the 1906 Antiquities Act to preserve a prehistoric American Indian mound-building culture dating from about 2500 to 800 years ago. To commemorate the anniversary, special programs are planned for October 24 and 25, including a night hike on Saturday evening. "Sunday in the Park" includes ranger-guided hikes and Native American and archeology presentations. Distinctive items from the monument's Ellison Orr Collection will be displayed. In addition, an official U.S. Postal Service 60th Anniversary Pictorial Postmark cancellation will be available to visitors on Sunday afternoon. Visit this weekend or anytime to explore all that this little big park has to offer!